Welum engages in promoting a universal voluntarism movement through displaying the work and stories of International Red Cross or Red Crescent youth volunteers in this short film – ”We Volunteer”. How often is it that we focus on the great work done by the ones creating the future— the youth volunteers all over the world making the future a better place to live? Welum worked with youth volunteers to create a display of why it is so important to participate, help others, and be part of a global community. "We Volunteer" displays the history of the efforts of young people across the globe and why it is important for individuals to be part of this family of fun, creativity, and effort. The work between the youth members and Welum is based on the common belief that young people strive to have a conscious mindset and want to care for and share with each other. The Welum-produced film wants to reach out to young people that have a common goal of living consciously, making decisions, and caring about the future of a globalized world. The film displays not only the work of the young volunteers, but also the thought and community behind this work. This film shows how a common goal can bring people together in a global way and how young people define the future. “Welum and the volunteers from Red Cross or Red Crescent Society came together to shed light on the invaluable work done by youth volunteers all over the world. At Welum, we prize a conscious mindset and herald the people who follow their passion and make a difference in this world. “Collaboration, community, team work, empathy, and taking action are but a few of our shared values, and to celebrate the commitment of youth in the Red Cross and Red Crescent Societies and encourage others to join the movement, we have created a short film. The film is a peek into the world of youth volunteering, and it aims to celebrate voluntarism and bridge the efforts of passionate youth across continents. “Enjoy, and remember to check out your national Red Cross organization and all its efforts to make this world a better place for tomorrow,” stated Welum’s Creative Director, Sara Bøgh. Share the link and message. Use the material to interact with others so that they might be inspired by and commit to the same efforts as the volunteers in the film. The film will be supported by an online publication, to be released in May 2018. You can subscribe for free on Welum and get the latest updates on the entire project. All material has been based on volunteer contributions and material from the public IFRC channels. 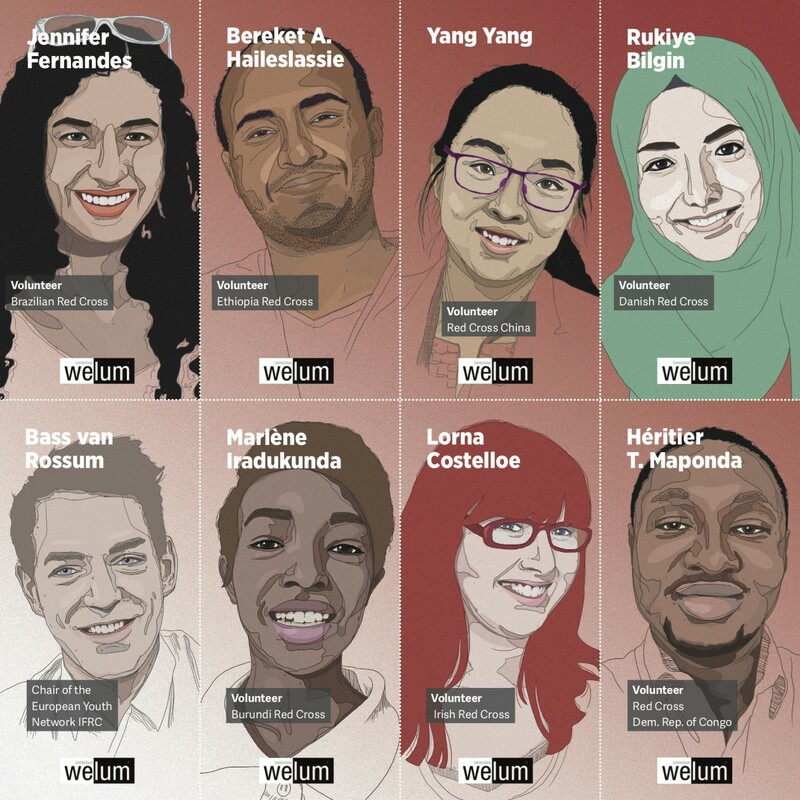 Welum engages in promoting a universal voluntarism movement through displaying the work and stories of international youth volunteers in a short film – We Volunteer. The film is followed by the art publication, Find a Friend. The spirit of doing volunteer work extends beyond being part of an organization. It is also about sharing contributions and love with those closest to us. Welum’s publication, Find a Friend, celebrates the people near us. Paper is a limited resource today, making it valuable to many. It is not something random to share, but has value in itself. Therefore, Welum is offering Find a Friend for free. The publication can be divided into eight parts and shared between friends, family, or people who should be celebrated for their contributions and may become a friend. Find a Friend measures 30 cm x 30 cm and can be downloaded for free at Welum.com. It displays illustrations by Welum Creative Director, Sara Bøgh, of volunteers from the Red Cross and Red Crescent global youth departments. Find a Friend can be given as a personal note or put up on the wall. 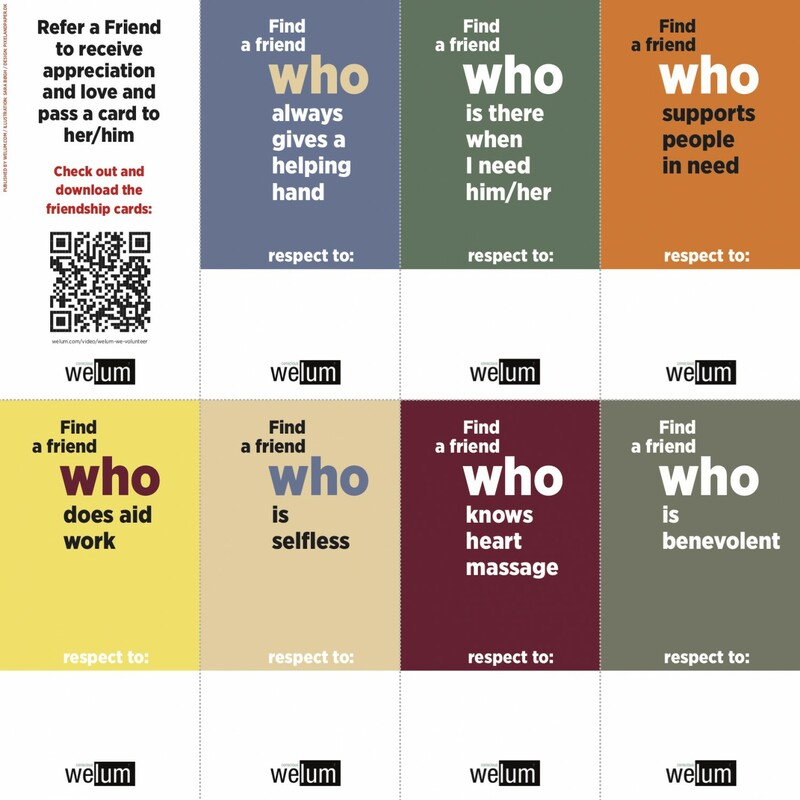 Creativity has many forms, and the printed cards in Find a Friend can be put up in different patterns and variable places. Most importantly, they are independent of digital media and can be seen and shared in an authentic way with a personal impact. “From my long collaboration with Red Cross, where I worked with graphic expressions together with other volunteers, I realized how much visibility and acknowledgment of work meant for each individual. This is a personal celebration of all of the effort each person puts in in their daily life,” Welum Art Director, Bo Sørensen, explains. This publication once again puts Welum on the creative landscape with an authentic and innovative way of combining consciousness with creativity and community. You can download the publication for free if you subscribe for free to Welum here. The publication can be found here in our store, together with all our other books, which you as subscriber can download for free.